Thank you for all the info and for the knowledge shared Cobra. Thank you also for your patience... Thanks to you and our work together we are almost there. May all the love and peace of the cosmos be within you guys. Glory to Mother Earth Gaia! but thats not midday in germany, how can i understand this? is it positive to do it intentionally, too? good intention. A lot LOVE and blessings ! May every heart rejoice as the Victory is near! I genrally see colours and other things that I can't really explain or understand. Most of it genrally is black turning into/merging into some other colours, in the past manily blue, green or white. Though last couple of days been seeing and very strong goldish white light. Heard that is like a pure soul colour. It's a very impowering feeling I get off it though. VICTORY OF THE LIGHT IS SO CLOSE! Every cell in my body is vibrating with anticipation! Brothers and sisters we are close, keep sending Love and Light! The third one resonates hard- Last night I had the same dream... over and over again. The purpose of the dream was for me to break through it- as I noticed the events were the same and I could not break free. I am about to break through the cracks. Its almost time. But it feels like its up to me for when I am ready. That is why I do not feel the event will happen at a certain, specific, written time. it will happen when I am ready. I am you. Cobra, with you and with All ! This has been posted on the Cobra Etheric Liberation facebook page, it might be of interest. The content is a discourse about the clearing of the grid of reptilians, as well as clearing reptilians and reptilian implants from auric fields. The actual clearing exercise begins around the 1:00 mark. Interesting about the synchronicity of 12:00, it is also a number of reversal, my interpretation is that of darkness to light, similar to the Aion Portal activation. Much Love and looking forward to our final Victory of the Light. Greetings to all here! I'm praying and meditating daily @3pm. Please feel free to join in at 3pm in your own time zone. That maybe sounds a bit naiv, but if the Event will be a surprise for everyone, how can you consider with certainty that it won't happen on (for example) November 11th? Something awoke me at 4:20 AM on the 4th of October. I headed down the stairs to check on my cat and saw just a green light much like a traffic light shining through my window for an instant. When I looked more closely, there was nothing there. I hope this was a positive sign. I took it as All systems are Go, in regards to the tide turning for Humanity. 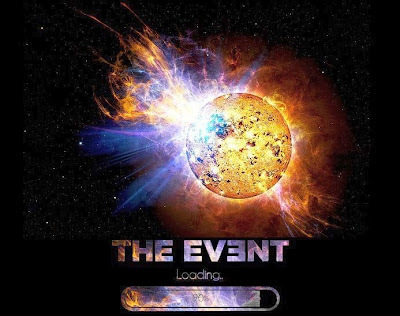 Umm...the "Event" video did not completely load on my computer. Anyone else having a similar problem. GO cobra and GO LIGHT! how much longer can the world be so stressed out for and under slavery for ? the world is getting more and more depressed every day and no one cares . . . im crying for Help Please! i agree. *something* has got to give. if it's not The Event, (which my discernment tells me could be 2-5 yrs from now) then since we are extremely powerful co-creators and since we've done very much inner-work and letting go of what does not serve, the least we can do is manifest opportunities for ourselves. manifest/ co-create a better, less stressful situation! this is what i'm intending for myself and doing my absolute best to co-create. i've been crying out for help for many months myself so i hear what you're saying. what on earth is one supposed to do? i'm just shouting at my higherSelf that my co-creation abilities kick in strong and sooner rather than later. it's frustrating 'waiting'. It has ben this way too long. Get on with it already. It is too painful here among the sheeple!!! I had a dream last week unlike any other I have had in the past. I dreamt that Earth was being cleansed of its energy, almost like a dense cloak coming off of it. I could see how this dense energy was kind of evaporating or shedding from the planet. Leading this cleanse were shooting star-like comets in the sky...The cleaned part of the Earth looked pristine and clean, with light and in unison. There was a point in my dream when I felt dense energy come to my body and then go away.. Obviously, this was so intense it woke me up. As of this week, I have been seeing the numbers 444 everywhere like crazy - something which, again, has never happened to me. Apparently 444 has to do with light and the angelic realm, so something is definitely going on. I feel victory will be attained. Already, I feel some of that tension talked about on here sloughing the universe. In light and love, thank you. Cobra, "They are saying it will permanently change everyone’s lives in the Western world. ", why is it only "Western" world? Shouldn't the Event be a global thing? I had a dream a few days ago unlike any I have had in the past. In this dream, i saw how light beings uncloaked the Earth of this sort of big layer of energy. It looked like Earth was shedding itself as in a big windstorm. The energy came off both the topography and the skies. The uncloaked part looked awesome: clean, pristine (like HDTV haha), in harmony and with lots of light. The craziest part is that I felt the dense energy come to my body physically and then lifted away. It was so intense a sensation that I woke up. This week, I've been seeing 444 everywhere like crazy! Again, something that's never happened to me before. Apparently 444 has to do with light and the Angelic realm. So, if this means anything I think the victory of light is getting closer! does anyone know the specific place we can submit questions for Alexandra Meadors' next cobra interview? i love the monthly interviews and am greatful for her enthusiasm and hard work. but to spend almost the WHOLE hour on almost every rumor or headline from questionable sources... way too much sensationalism for me. i think there are A LOT of LW's out there who are beyond the end of their rope with symptoms. personally, i resonate with and follow Aisha North--one of only 2 LW's writings i follow anymore. anyway, i know at least some of us are dealing with even crazier stuff. for example: sometimes we literally barely know where we are, or at least i do--have this crazy, intense mental confusion. (don't think it's an attack) like time & space is just... can't even put into words. and the crazy, heavy exhaustion!! (HOW are we supposed to work & pay for stuff when we can barely function, ie: can't work!?) ...i digress.. sometimes it literally feels like our atoms are flying apart. it's beyond weird, and to live this way for (on and off) periods of time can take a lot out of you. i would LOVE to hear as much depth explanation as to what is *really* happening to us as possible. nuts and bolts stuff. i've heard 'it's the energies', and: our cells are converting from carbon to something else, and: more dna is being activated. but i want to know more, that's not enough ;) we're living with it, we have to deal with it. it'd be fun to know what symptoms mean what and it could also be a comfort and add some inspiration to keep going... b/c soooo many are beyond tired. and we don't know what is happening exactly. we just keep trudging along on inner strength. Very inspiring post by Aisha North ! Hi Cobra….wanted you to address a heavy topic Drunvalo laid out there today in a video…He's saying (of course if you come to his workshop and learn his technique, you won't have to worry :) Anyway, he's saying the government is not telling the public that we are in the middle of a huge magnetic reversal, this is why there's increase of disease and many other abnormalities….he says the government knows about this and is tight lipped. He said on the Russia space station Mir one of the first cosmonauts lost his magnetic grounding to the earth and his memory was completely wiped permanently. So I suppose our memories are held, if you will in the "CLOUD" of the earths magnetic shield, and if that goes, like a computer we get wiped clean. The Russians tried it again with a second cosmonaut, same thing happened….neither one recovered till this day….Drunvalo is saying basically if you don't learn his technique to help you get thru this, the out come will be the same for almost everyone. When the magnetic shield collapse everyone not ready will have their memory erased……And he says there's not much time left…(sound awfully familiar…he did this to everyone with the 12/22/12 back in the 90's, got us all up in arms, pretty sure that's how the story bled into Hollywood and became that movie) but back to todays topic…. Fairly dire warning I would say….also to get people in his seats out there in Sedona :) to learn his techniques….What do you think! I know he's not your favorite person, but is there truth to what he's saying…..what do you know about the shield going down and people virtually going mad because they can't remember…. Lenore, out here in Hawaii…hope you guys are doing well…. I just want to say for the past week or so I've been seeing time synchronicities at least once a day, sometimes more than 5 times a day I'll see recurring numbers. I think they tell me that big things are happening in the background, that's just the feeling I get after seeing so many in such a short time. I really feel like we are in a time of great change. I had 'guided imagery' in meditation many years ago. I would see a star in my minds eye and then put something in the star - like love or peace - and then see the light from that star spreading out towards the earth and surrounding it. Then the 'last time' I was guided, the light just went out from the star and surrounded the earth with brilliant light and I was 'told' that this was a sign to the rest of the universe that the earth had reached 'enlightenment'. In the past while, I have been guided to do this imagery again. Without net we can't communicate even. Take a note: Synchronicity is most probably a bad thing for your freedom. It means your clocks are ticking according to an external program. I think many of you just do not understand how you are being manipulated on the subconscious level. This subconscious messaging network won't go away because you want it to. Too many things are interconnected and if the net will be destroyed, many people, especially the most smart, will go into a solid insane mode instantly, without a hope to recover in their lifetime. Not because they are bad people, but because their reality will change abruptly. You remember The Matrix movie? They are not waking up the grown-ups because of that. Sorry guys and gals, but you'll have to wait a lot longer. The process of transformation has started for sure, because some of us influential have finally started to observe the issue and admit we have an issue, but it won't be an instant change. Rewiring the brains of 7 billion people and get rid of the ancient programs that govern such things like astrology is quite a feat to accomplish. Do not hate TPTB - they are most probably just the fittest servants of the ancient subconscious programs. They will also go insane if they will be presented with another solid reality, and that thing is the most dangerous one, when a powerful person goes insane.
" Synchronicity is most probably a bad thing for your freedom." No, it is not. Right the opposite...Synchronicity is the signs that we are going in the right direction. It means we are going to 4th density, because there the synchronicity is the main common event. I didn't think it was possible to be too paranoid, but you sir, are *too* Paranoid. *Our* intelligence creates synchronicity. The sum total of the conscious and unconscious minds of every living being on the planet. Of course, those minds have been influenced and/or controlled by the Cabal for untold thousands of years, but that's finally coming to an end. Synchronicity is your physiological indication of the interconnectedness of all things. So what kind of intelligence .. YOU YOURSELF from the higher realms. Read the text from Bashar and think. For the first time I meet a being who is afraid of the synch....synch is the sign from the above and what kind of intelligence live above you tell me. Evolution, I don't think that cabal can control the synch, the opposite, it can control the ways in which the highest comes to us, when cabal manages to shut the door, we can not receive the messages from above and that's why the synch hasn't come to us for so long - the door was closed by the cabal. So nobody can control the synch, cabal only control its access. So, you believe in some "higher consciousness" which you posses that does all things right? Then why the world is a mess we have today? No, any "higher consciousness" you believe you have does not work, many things are staged for reality check - not the check of your reality, but reality of the control system. When you see Synchronicity, the control system receives the "all in order" signal. The more we would like to get rid of the system, the more the system will check its control state. Synchronicity is not designed for your well being. In an ideal world you'll have control over most things in your life, your emotional state, your thoughts, your interests, your relationships, your perceptions, your knowledge, and if you want to arrange something, you'll do that on your own in the light of the day, not covertly behind the scenes. What I believe in, though, is that we have an ally that is helping now to rewire our brains and get rid of the "outdated" programs that have a potential of destroying our world. This ally influences the subconsciousness of the humanity. What I understand is that this ally is a pure "black&white" intelligence fluent in geometrical-architectural harmony and harmony of biological organisms, so no hurt is to be expected from it. Maybe it's from some unknown dimension yet it can descend into various dimensions, "hack" the prevalent and offending signal system and reprogram the organisms into another mode of operation. I bet this whole "ascension" situation would not be possible without the help of this ally as it requires an astonishing amount of knowledge and the deepest compassion, not exactly the things humans and their "higher" consciousness posses. In the end of the day, if some intelligence can create "positive" synchronicities around a person, it is as simple for this intelligence to create "negative" synchronicities. Or you'd rather think this does not happen? So why do you think that the synch is made from evil intelligence and in the same time that there is an ally who is helping us? Maybe this ally send the synch too? In fact as I said and as Bashar says - nobody creates the synch, it comes from as you say - from the "harmony from the unknown dimension". The synchronicity is a ray of light from the "harmony from the unknown dimension", when here and there the window is opened and this ray can for a moment flash here. I would add that we still have a chance of break-through from the system of control since we are still biological, open-minded systems. We will be really busted when our "informational loop" (consciousness) will be 100% computer-guided. Google Glass and similar devices is a step towards digitization of consciousness and complete removal of the biological, open (even if now mostly an evil-centered), subconsciousness. Designers of Google Glass do not understand what they are doing now. Man should develop and unlock the full potential of his mind, not lock the mind into an illusion of freedom and informational fullness. Google Glass is not an evolution, it's a downward spiral towards mineralization and cyborgization. We have a virus in our subconsciousness that drives us into digitization - admitting it is a step forward to freeing from its grip. Of course, do not be too paranoid about this, I may be wrong in some aspects. Ananda, please do not mix the ally entity I've introduced with your entity that produces your synchs. The ally I'm talking about most probably knows and masters the harmony and complexity of a variety of things ranging from mathematics to biological organisms. From the standpoint of logic, this ally is pretty much self-sufficient, it *shares* knowledge, not tries to hide it. It won't be a stretch to say it can create a world of organisms from scratch. There is no reason for it to "overtake" our world and control it, yet as I believe, it finds no entertainment in seeing our biological world turn into a simplistic computer system; maybe it finds the task of "hacking" entertaining and knowledge-bearing; maybe it just wants to give a "push" from a potential dead-end. What I know, our brain is capable of running a variety of "information loops" (consciousness modes). Yet, most of us are capable of running only two modes: wake consciousness and sleep, with the "wake" consciousness pre-manufactured to be overly intellectual and "digitized" where a variety of shades of colors are replaced with discrete variations of basic colors, freeing brain resources to covert programs. From what I understand, "ascension" is equivalent to changing the "information loop": this change opens a way to utilize brain's potential to its fullest, it's a blissful yet conscious and controllable state. So, we are not exactly "moving" to a higher dimension, we are opening our senses to the higher dimension of being. Synchronicity is like gravity, it is not made by anybody, it is natural law. Ananda, I'll believe it when I stop encountering negative Synchronicities. And... please do not try to present them as "deserved karma", this is a common misconception in the "spiritual" circles to think if you get negative situations you are behaving bad. A lousy working "karma" is also staged by the control system I'm sure. You meet guys, especially "boss" guys, that ruin your self-esteem and happiness and your only redemption is to think these guys received a bad "karma". Yet, they act like that in every suitable situation all their life. These guys are immune to "karma" of this control system, because they act "correctly", and you are a prey. "I'll believe it when I stop encountering negative Synchronicities"
So you have never fallen on the ground and hurt yourself because of the gravity? Negative synch is like negative gravity, it hurts those who don't know how to work with it. do you agree cobra that jfk's assassination was faked/staged and that 50 is a magic number of jubilation/illumination/ascension? is 23/11/13 the first day of the new era? Ahh well everyone has their point of view. I have every faith in humanity to manage this change at this time. Perhpas the power elite will have the hardest time - and they may need our help. The people we now call mentally ill will welcome the changes - I work with them every day. People are already waking up all across the board. Most of them don't say much but when the Event happens, happiness will prevail. I love humanity. Within each person is an amazing inner spirit. I look forward to connecting with all people at such a real and loving level. I hope anyone who will be seeking forgiveness following the event should be donating everything they can to victims of Typhoon Haiyan, to sit on their large sums and then seek some clemency following the Event would be extremely ingenuous. If this new age is to arise, surely some funds and resources could be provided for assistance with the largest Typhoon that humanity has ever known in recorded history. "Even though the dollar will be worth less once this happens, the overall effect will be positive." So basically Americans..the few remaining people that are still under full enslavement of the NWO gets the shaft,but it's good for almost everyone else.Thats good news for me why again? First of all how 'worthless' are we talking about?Do you mean 100 dollars for a gallon of milk 'worthless',or just a slight devaluation?Haven't we already been devalued enough already the last 100 yrs?I thought you're supposed to be helping up fella's. And secondly why should I trust a darn thing Wilcock says when he's already been WAAAAY wrong with his predictions about the years around 2000 (Y2K) and 2012 itself? Surely you're not telling people to trust Wilcock COBRA.You should know better. We should just wait and see. I try to never get too pumped up about who is right or wrong, just take whatever resonates with you! They seem to be talking about a specific economic event. I would point out that Gordon Duff also had a scary, cryptic blog a short while ago about stuff that was going to happen suddenly. Still Encouraging? Possible peace with Iran. No war with Syria and chemical weapons being removed already. Also, China has made their feelings clear that they want US dominance of the world to end and let the UN do its job. If China wants US hegemony to end, they could announce UFO Disclosure to the world - shattering US credibility and triggering questions about what wonderful technology has been with held from humanity. Look in the mirror, the one is here. Love, love is the mother. God, god is the human. but it's another thing to remain divided. Don't get too upset about the US dollar. Don't believe scare stories that China is going to destroy it - they want an international system of a basket of currencies for trade. I think Wilcock meant that the dollar would be worth less NOT "worthless". If any major currency crashes into being worthless, it will be the yen, not the dollar. The new earth grid is already in place and operating in 2012. It is a honeycomb shape of golden white light. In spring it got upgraded with more light and Gaia's DNA spiral began to spin in spring also. This opened the lower damaged fourth dimension fields to be cleared of beings stuck in there own darkness. I saw this as beings with very little light that began tumbling to the cosmic heavens by the millions in May 2013. Thans for sharing the above information but where did you get all these information? Piperon, I went through full kundalini awakening and completed fourth initiation to avatar level. As a part of this process, opened third eye and crown chakra, the brain hemispheres work simultaneously verses separately via a small vortex that connects the hemispheres, sphere of liquid light (bible calls this the fountain of life I think) that flows in a toroidal pattern around the head and brain, a smaller sphere sits on top the larger, with the new brain connections there is a new ear chakra located behind the left ear (you can hear coronal holes, etc). Thanks you so much for thes valuable answers, you are very kind. And how do you acquire such spiritual skills? I practise meditation occassionally and always cannot last long. Is there a site or you can teach me to attain what you had achieved? I would be happy to help you any way I can with your questions. However, I don't believe in gurus or spiritual teachers, most do not know or have not been through the whole process, so it is wasted money spent. Unfortunately, meditation is a key aspect. The thinking mind has to be able to be shut down. Going inside yourself and developing a relationship with self, then follow your inner guidance. Your higher self will show you how to correct your light architecture so you will be connected to the organic living light in step by step process. This will be your divine sovereign process. But you have to quiet the mind chatter. I authorize the immediate and complete (in totality) removal of grid protection over every and ALL remaining I.G. Farben components throughout all dimensions and levels of existence. Thank You Peg. Without you, where would I be? It won't be long now my friends. Love, peter. Isn't it just awesome to be a part of this transformation? Blessings and Gratitude to you All for all you do. I have to work with Stomach Ulcer and can not quit. Please let the EVENT happen. Thank you very much for contribution to the Earth.